During the game, players will gain resources and they can use these resources to gain extra or stronger pawns, plus they can be used to build buildings/totem poles and gain equipment which give the player extra abilities as well as score victory points (VPs). Resources can also be sold for cash which can buy VPs too. The game ends after a fixed number of rounds and the player with most VPs wins. This may all sound fairly straight-forwards; however, it’s the area control part of the game which gives Dakota its identity and great gameplay. 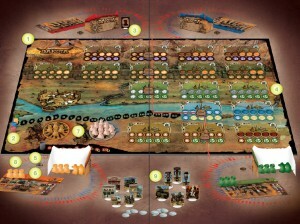 Each round players take turns placing pawns onto different open areas of the board and each area has some resources on it. At the start of the game, the natural resources (fish, wheat, etc.) are more useful/valuable to the natives but, as an area’s resources are consumed, ‘industrial’ resources (gold, iron) become accessible which are more useful/valuable to the settlers. When an area is completely depleted of resources a new fresh area of the same type (plains, river, forest, etc.) opens up (if available), so resources useful to both sides can continually enter the game. On their turn, players place 3 pawns (first their own pawns and then any neutral pawns to make up the numbers). Whenever a player gains a new pawn of their own, one of the matching neutral pawns is removed. After two turns of placing pawns, all the player and neutral pawns will have been placed and each area is assessed. 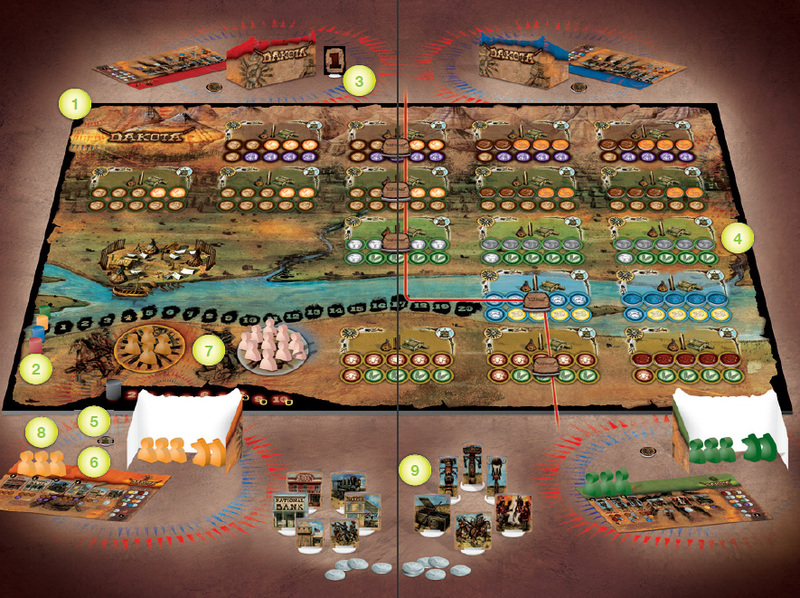 First, the total strength of each side is compared – whichever side (settlers or natives) has the greater strength wins the area and shares out the resources in the area. The player on the winning side with the greatest strength picks a resource, removes a pawn and then this is repeated until all pawns have taken a resource. Of course, there may not be enough resources to go around. The placement game mechanics mean that players on the same side are joined in their goal to win an area but they’re still opponents – I shall call them ‘allies’ from hereon. This can create a very uneasy atmosphere. You want to work as a team to win areas but then you don’t want your ‘allies’ to do better than you too many times or they will win and not you. So, in some cases, you need to watch your ‘allies’ even more than the players on the other side. First player and turn order (which progress clockwise) are very important too. Dakota is definitely a game where co-operation is essential. If you don’t co-operate with your ‘allies, the in-fighting will drag you both/all down and other other side will capitalise on this (unless they’re squabbling too). The settlers need to focus on stripping the resources in some areas to get to the resources they really need like iron and gold, although the natives can strip these themselves so a new fresh, natural area opens. Denying your opposing side from a resource can be very effective, plus you can always sell any resource. Players can purchase resources (with cash earned by selling resources) but purchasing requires a pawn to be placed in the market for that round and only one resource per pawn can be bought. So, the resource purchase option is very useful but does use essential pawns. Selling resources is made more interesting by the fact that the values of goods for settlers and for natives are different. The different improvements (settlements and reinforcements) are the main ways to gain VPs and are gained by spending resources. I would have liked a few more options for variety and to be able to build different items to my ‘allies’ as there aren’t that many, although the improvements available to the two sides are very different (as are their resource costs). The natives’ totem poles are interesting as they allow the natives to regenerate natural resources which slows down the settlers’ resource stripping. The choice of whether to gain a new pawn or to convert one of your strength 1 pawns into a pawn with a strength of 2 is an interesting and tough decision too. Most games allow you to do a few negative things to other players which are temporary or ‘funny’; however, Dakota doesn’t give much (if any) room for this as any action that hinders one of your ‘allies’ can easily cause massive disagreements and grudges. So, best to play Dakota with people you know can handle this kind of interaction. Of course, this can all be avoided by just working together in some areas and trying to gain more than them in areas where your ‘allies’ aren’t present. Before going to Essen, I read that Dakota was a vicious game and, having played it, I totally agree, but that’s not a bad thing. The viciousness is part of the game’s fun and what makes it exciting and different. Every pawn placement is important (as you only have a few) and there’s no luck element. It plays 3-5 players but I expect 4 and 5 is best as that delivers more pawn combinations in areas which will add to the tactical variety. 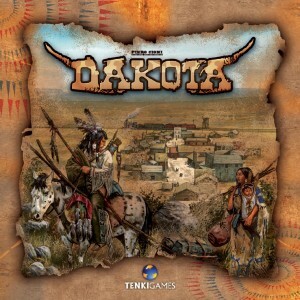 For me, Dakota is a nerve-wracking, exciting and fresh game. 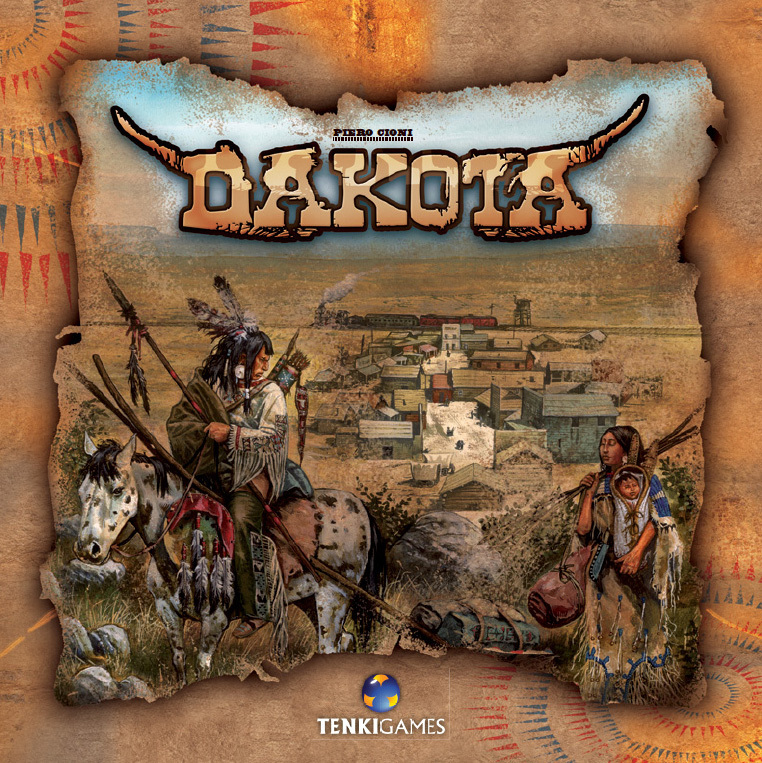 This entry was posted on Sunday, November 14th, 2010 at 7:00 pm	and is filed under Board Game Review, Board Games, Dakota, Essen Spiel 10. You can follow any responses to this entry through the RSS 2.0 feed. You can leave a response, or trackback from your own site.